What is the Best Heavy Duty Sewing Machine in 2019? Do you need something that can handle thick or multiple layers of fabric? Then you’ve come to the right place. The best heavy duty sewing machines are built to handle projects that require more layers of fabric or thicker, weighty material – like jeans or upholstery. These kinds of projects can’t or are difficult to do on a regular sewing machine. If you’ve had your machine stall or tip over then it’s time to find something a little more robust. If you are looking for something that can sew through denim, leather or upholstery then you really a model that will stay in place when working with the drag of thick and heavy fabrics. One of the most important characteristics when looking for a machine is it’s weight. You want to make sure that the model you choose weighs at least 14 pounds. Ideally, if you want to be really satisfied with your choice, you want something heavier that 20 pounds. This of course means they aren’t as portable, but they will be able to handle the your projects without tipping, stalling or bouncing around on the table (my cat hates that). The next thing to consider are usability, features and durability of the machine. Features are important for a lot of people who always like to try out new projects. However, if you own a business you might know exactly what features you need your machine to include and what is just extras. If you plan on using your machine a lot of projects that involve leather, upholstery or many layers of fabrics then you should buy a machine that is close to or above 20 pounds. The heavier it is, the more sturdy and stable it is on your work table and the easier it will be to work with. This is also important if you plan on doing any machine quilting. The following are my favorite heavy duty machines you can use in your home. There are suggestions that are suitable for the at-home sewer and for those who are serious about sewing. I hope this post helps you find the one that suits your needs the most. If you don’t need a computerized machine or hundreds of stitches this is a great choice even for a beginner. You will be able to accomplish any project (including upholstery or leather) no matter how thick the layers of fabric are. I have used this to sew through 7 layers of upholstery fabric and it flew through it like it was 1 layer. The durability and quality of performance of this product is outstanding. If you end up purchasing the HD3000, it could very well be the last one you ever have to purchase. It is a perfect all-round home sewing machine that performs all tasks flawlessly and doesn’t break the bank. A less expensive option (around $150) you can buy this terrific Singer heavy duty sewing machine . Like other Singer models, the Singer 4423 has been one of the top selling models on Amazon for years. This is because it is inexpensive, does a great job of every day sewing tasks and has the perfect amount of features for the at-home seamstress. One thing that I liked about this product was the design and usage of it is very clear and straightforward. The stitch selection is really good and it does a really nice job with all of the basic stitches. I have seen machines perform better with decorative ones, but the Singer 4423 still did a decent job with them. This isn’t really a big deal as most people don’t use decorative stitches very often anyways. When testing with multiple layers of cotton it performed really well for the price. The layers and needle fed through nicely and the results were nice. However, when moving to heavier fabrics, like denim, this product didn’t perform as well. It had more trouble feeding the fabric through and it wasn’t strong enough for my liking to do the job properly. 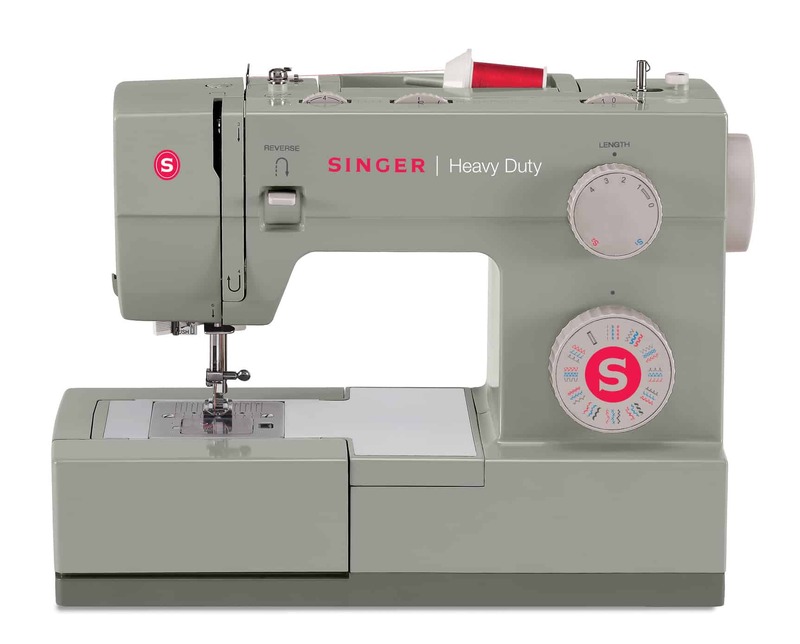 If you want one to use in your home for day-to-day sewing projects and aren’t going to be working with many thick, weighty fabrics, then the Singer 4423 is a perfect choice. Singer sewing machines are really good for the hobbyist who aren’t going to be putting their’s through a lot of hours of wear and tear. 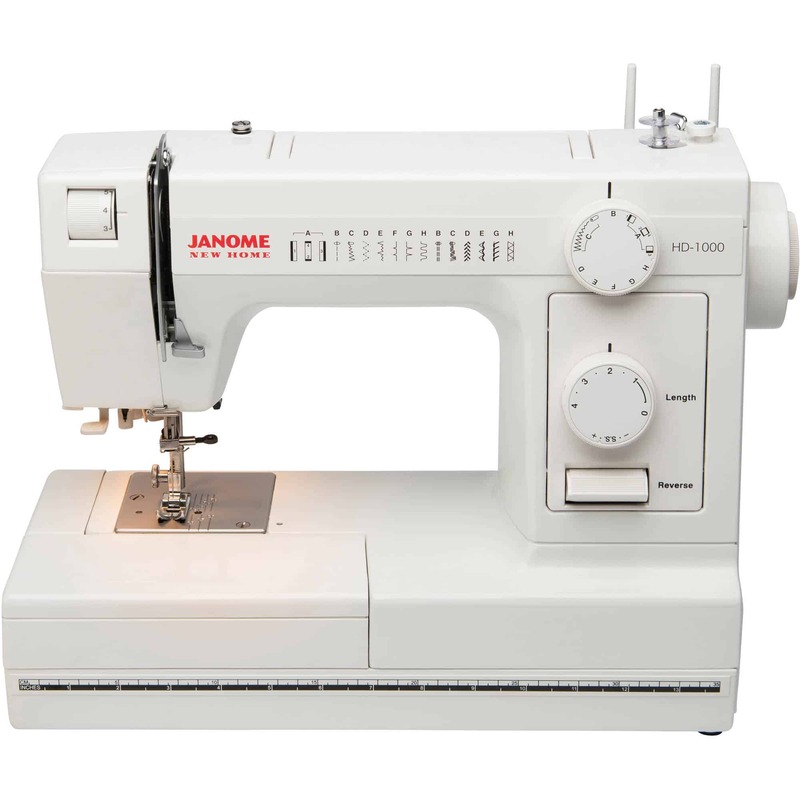 However, if you plan on using a it for a small business or more demanding projects, then you should seriously consider one of the Janome heavy duty models reviewed on this page. Free arm for sewing collars, pants, etc. This thing will handle anything that you throw at it. I have tried leather, layers of denim, you name it, it can do it. It is a true work-horse and the results are outstanding. For under $300 this is an outstanding buy in this category. I was very impressed with the sewing speed, stitch quality and even the quiet way it went about its work. This product is built to last with a rare aluminum frame that has that classic sewing machine look and feel. The Singer 4452 is a heavy-duty sewing machine with an array of features. This machine has more than two dozen stitches (including a 1-step buttonhole), automatic threading and high-speed sewing. Whatever project you have in mind, the 4452 can handle it. One of the more frustrating, or time-consuming, aspects of sewing is threading the machine. The 4452 has a threading path printed right on the machine, and the automatic needle threader will thread the eye of the needle for you. You can say good-bye to eye strain and frustration. One thing you’ll like about the 4452 is its high sewing speed. The machine can perform 1,100 stitches per minute, which means that you get projects done faster. The heavy-duty metal frame allows for skip-free sewing, even when working with thick fabrics or layers of fabric. The 4452 also allows you to drop the feed lever to disengage the feed dogs. This makes it easy to attach buttons or darn socks and pants. You can also use this feature for free-motion sewing. Singer built this machine with a motor that’s 60% stronger than standard sewing machines. You’ll be able to sew through heavyweight fabrics with ease. All accessories are conveniently stored in the accessory tray. Singer also includes a soft dust cover for the machine. The Singer 4411 is a step down from the 4452 in terms of features, but this machine is every bit as capable of handling difficult projects. Its design is similar to the 4452, and the model boasts the same durable construction. The top drop-in bobbin is convenient and easy to insert and remove. The clear view cover allows you to keep an eye on your thread at all times. The stainless-steel bed plate allows you to sew effortlessly, as fabrics easily glide across the machine. Singer also allows you to customize the appearance of a stitch by adjusting the length and width. The highest width – 6mm – will give your stitches a pronounced, bold look. There’s a reverse sewing feature to make sure that your stitches don’t unravel. Reverse stitches are typically used at the beginning and end of a seam. Four presser feet are included with this machine: all-purpose, buttonhole, zipper foot, button sewing foot. Singer also makes it easy to get started sewing with your machine thanks to the SINGER Sewing Assistant App. You can use this app to view tutorials and even view the most frequently asked questions regarding your machine. 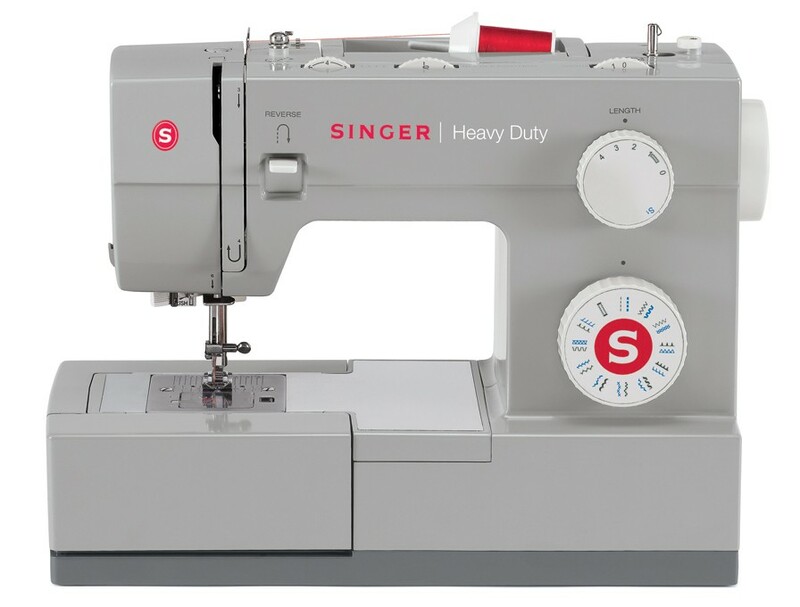 If you’re looking for a heavy-duty sewing machine that gets the job done without all of the bells and whistles of more expensive machines, the Singer 4411 is a great option. Strong and Tough describes the Brother ST531HD well. While this machine is great for everyday sewing and mending, it can also tackle more difficult projects that other sewing machines can’t handle. The machine is simple in design, but easy to use. All of the stitches are listed in a diagram on the front of the machine. Controls are found at the top and side of the machine for easy accessibility during use. The ST531 can handle any fabric, from lightweight silk to up to six layers of denim. That’s pretty impressive for any heavy-duty sewing machine. The durable metal frame allows for skip-free sewing, and the metal plate allows you to feed fabric through the machine as smoothly as possible. A metal finger guard is included to protect your fingers as you sew. Brother also includes three heavy-duty needles: #16, #14 and #11. The free arm allows you to sew cuffs, sleeves and pant legs with ease. Brother also includes an instructional DVD, which makes it so easy to learn how to use your machine. You can also find tutorials online. Brother’s ST531 can tackle any project you throw at it, whether you want to work with denim or silk. 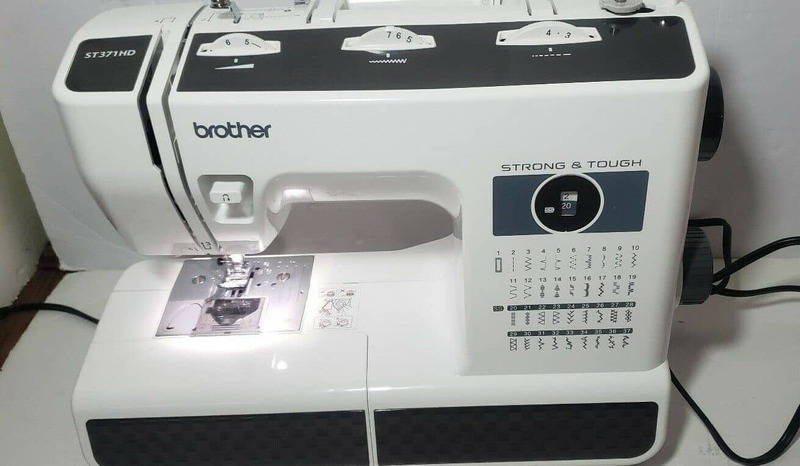 Brother offers the ST371HD sewing machine that is the company’s Strong and Tough model. This sewing machine is designed to work through thick, heavy materials and offers a truly lightweight design, making this the go-to choice in portability. Tackle heavy-duty fabric with the ST371HD, from jean to canvas and burlap. Suede and leather can also be quickly sewn through thanks to the power and versatility of this sewing machine. A free arm design allows you to make quick and easy sewing adjustments to sew sleeves, hems and even cuffs. When it comes time to thread your needle, you can rest assured that you’ll thread in record time thanks to the automatic needle threading system. The jam-resistant bobbin is in the drop-in style, and makes it quick and easy to get your next project started and finished. There are six versatile presser feet provided along with a non-stick foot, which is ideal for thicker fabrics. Never worry about the foot getting snagged and causing the fabric to move slowly through your hands during operation. Brother left nothing to chance with this sewing machine and even includes an instructional DVD that allows users to quickly get started with their new sewing machine. Easy stitching and power are what separates this sewing machine from the competition. Users also boast about the ease of sewing through suede and other thick materials. A dust cover is also included to protect the unit’s internal components from dust, which can cause faster breakdown and lower the longevity of the sewing machine. 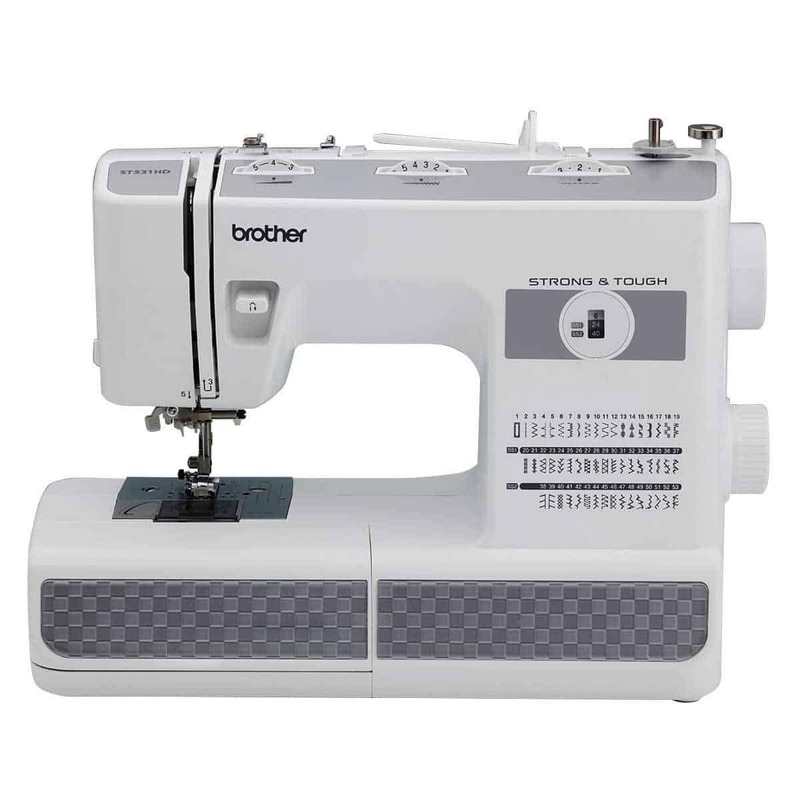 Automatically-sized buttonholes allow you to make everything, from jean pants to shirts and even jackets using the same, reliable Brother ST371HD sewing machine. You don’t even need to oil this machine, according to the manual. You can’t have a list of heavy-duty sewing machines and not include the Toyota Super Jeans sewing machine. Yes, this sewing machine is made by the same Toyota that’s famous for making reliable vehicles. The company has actually been making sewing machines since 1946, but they are just now available in the United States. The Super Jeans sewing machine can sew up to 12 layers of denim at a time – and without missing a stitch. This sewing machine comes equipped with an automatic needle threader to make threading a breeze. The machine’s front face plate also acts as a storage spot for the Quick Guide Advisor. The advisor acts as a reference guide to make threading the bobbin or needle easier. The machine also comes with a free arm for easy sewing of pant legs, sleeves and cuffs. In total, the machine has 17 stitches. Choosing stitches is easy, too. Just turn the dial to your desired stitch, and you’re ready to go. There’s a stitch selection guide on the front of the machine for your convenience. The drop-in bobbin system makes it so easy to change the bobbin whenever you run out. The clear cover makes it easy to see when you are running out of bobbin thread. The machine comes with just about everything you could possibly need to start sewing right away. It’s lightweight, too at just 10.8lbs. There really aren’t many complaints with this machine. It’s durable, it’s reliable and it’s so easy to use. It can sew through the thickest layers of denim with ease. But there’s only one small gripe that we had. We found some retailers selling this machine with a nice extension table, and others did not include this accessory. While not a deal breaker, this is something to keep in mind. 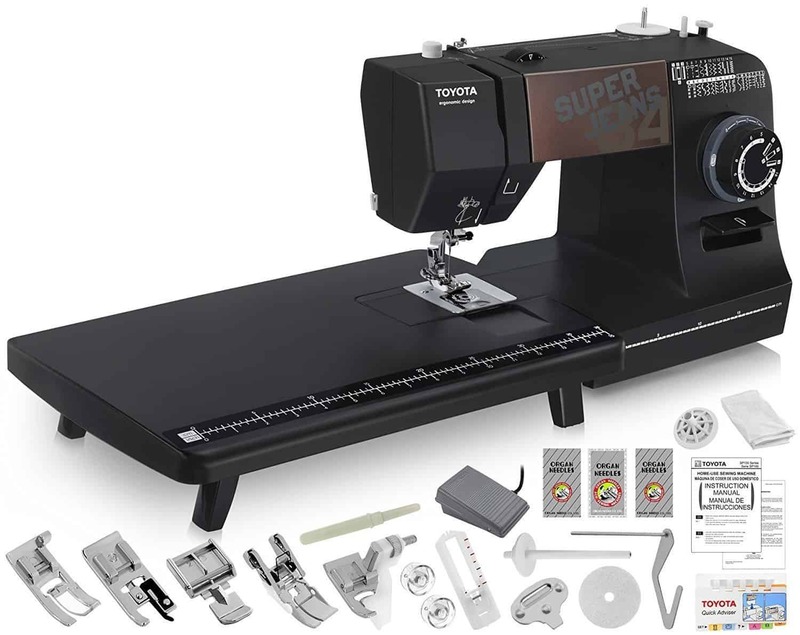 Overall, the Toyota Super Jeans sewing machine is hard to beat in the heavy-duty department, and it will give you many years of use with proper care. 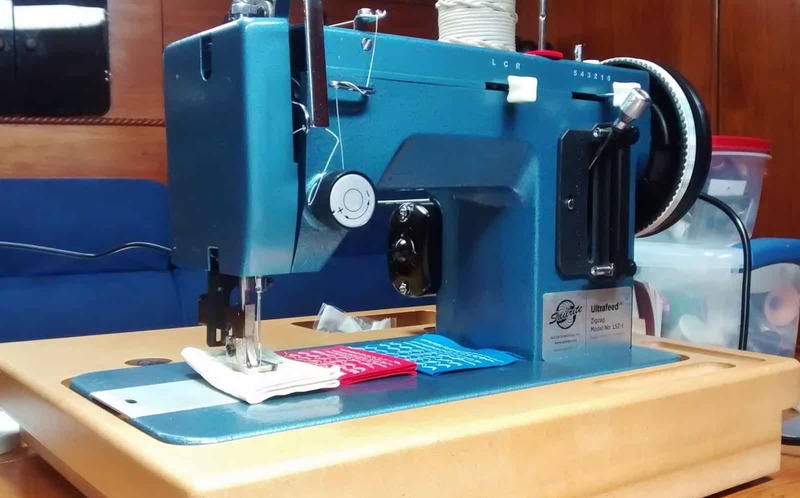 Sailrite’s LSZ-1 Basic is a walking foot sewing machine that’s packed with high-end features and can sew through heavy material, such as sailcloth and denim, with ease. The model has been tested to sew through 10 layers of canvas and 8 layers of Dacron. The power behind the LSZ-1 is in the Power Plus Balance Wheel, which provides double the power that a traditional flywheel model offers. Sailrite offers one of the most heavy-duty, durable machines on the market, with the capability of sewing through the thickest material on the market. This model is powerful enough to make quick work of layered denim, and it provides you with a wooden base that makes it heavier but also sturdier when in use. The model has a variable stitch length as well as a 3/8″ foot lift, with the power transfer from the balance wheel producing 100% power – most models lose power during the transfer. On top of the machine are built-in handholds that make transport easy, but this unit does weigh nearly 50 pounds, so it’s not as easy to transport as the Janome HD3000 or other items on our list. While not for everyone, this is one of the best sewing machines in the world in terms of power, so it’s a smart buy if you tend to sew through canvas, denim, sailcloth, upholstery, vinyl or even soft leather. An EZ Set Stitch Length Plate also reinforces your sewing with consistent, even stitches all throughout your project. The spring-loaded stitch length lever also helps you make quick turns for accurate, precise sewing when you need it most. While more expensive than other models on our list, this is the go-to choice for anyone that finds themselves working on multi-layer projects or with thick fabric regularly. If you are a beginner, are looking for an inexpensive heavy product and don’t plan on doing too much layering, then look no further than the Brother ST371HD or Singer 4423. They have excellent reviews, is inexpensive and does the job well on all kinds of fabric. If you want it for more demanding projects and you are going to use it often or need to tackle upholstery jobs, then the Janome HD1000 may fit your needs better. However, if you are planning on working with very thick and dense material then you should definitely consider choosing the Sailrite or Janome HD3000 model . Even if you are unsure if you will be working on those types of projects the HD3000 isn’t much more expensive than the HD1000. If you don’t have to save the extra few dollars, then this one is really an easy choice to make. All these models that we have reviewed on this page were all personally tested by us. The things that we have accounted for the review are; price, usability, features, specifications, durability and comfortability when using the model. So, having said all that, these models are our favorite ones out of the bunch (which was A LOT). If you are looking to do heavy duty jobs then these are your go-to models, they are reliable and will get the job done perfectly regardless of your needs. I voluntarily sew for the “dress a girl around the world” and have turned in over 750 dresses in a little over two years. I have beaten to death my 17 year old Husqvarna and need a heavy duty machine. I see Costco has the Janome but not the two models you reviewed. Is the model 4030P a newer one? With Costco I can return it if it doesn’t work out. ‘Thanks for your help. I sew at least two hours a day and am having problems with broken needles and tension on the underside of the stitches. It is currently in the shop for its 2nd repair in 6 months. Help, I need a new heavy duty machine. I haven’t used the 4030P myself, but I asked around and everything I have heard about it sounds really good. The reviews I have read are also good. I hope that helps. I too am looking at the Janome 4030p at Costco vs the Janome hd3000. Did you go ahead and purchase? What are your thoughts? I have an at home diaper business and probably sew around 4-6 hours a day. Thanks for your input! Hi There, I’m so glad I’ve found someone that knows their stuff because I’m now trying to find my third heavy duty machine. I purchased the Singer 4423 but found it to be almost too light to hold itself in place even sitting it in a rubber mat. Then I purchased a beautiful Singer 301 long tail Slant head; had it serviced and couldn’t wait to try it out. With a brand new needle (or three), it cannot sew two thin layers of leather together without having to walk it. I had heard with this style, you never need to help ease it on to start sewing. But not even with 1oz of somewhat stiff leather (much like a poster board), it’s unable to preform which is sad because the weight of the unit is great. I cannot ask my husband for another machine since it’s only been 6 months since I purchased the other two. Any suggestions on what I can do? I’m just trying to make simple and light weighted handbags for people like myself that have spinal issues and require lightweight totes without giving up style. Hi Shannon, Unfortunately I don’t know much about the Singer 301 sewing machine. Without looking into it too much I’m assuming that machine just doesn’t have a powerful enough motor to get through leather. If you want to work with leather you’ll likely have to get something with a bit more power. You might want to talk to some sewing machine stores in your area to see what they recommend or see if they accept trades. The rolling presser foot works. Also, I learned to put a piece of cloth on top of the leather on right side Of needle under presser foot it shouldn’t drag too much. Your motor is weak that’s the main problem. I sew a ton and have found that using a dollar finger nail file (foam ones) are so helpful under the foot when sewing through thick layers. Think of it as you foot needs to be level and not angled. I hope that helps. I fill in the gap under my foot with the nail file while sewing. Yes the Janome HD3000 is a fantastic sewing machine that is able to do everyday sewing as well as heavy duty projects. I’m sure that she will love it. Do you have any information on the Singer heavy duty 4443 that was recently discontinued and sold at Tuesday Morning? Is it a good machine? Is the Janome heavy duty 3000 a better machine then the Singer hd 4443? The singer 4443 is a nice machine and good for its price point, but I do prefer the janome heavy duty 3000. If I was choosing between the two and price wasn’t an issue I would definitely go with the hd3000. I sew pet beds/pads. I usually use flannel with 4 layers of 4 oz. batting. Do you recommend a sewing machine that would handle this. Not hard to sew through just a little thick. If you don’t want to spend too much money then the singer 4423 should be fine. That isn’t too much fabric to go through so I don’t see a problem if you went with that machine. I’m sorry, but I’m unaware of a portable sewing machine that could do that kind of work. Maybe consider contacting an upholsterer to see if they can point you in the right direction. I appreciate the evaluations as I am looking for a sturdy sewing machine. Do you know anything about the Singer Confidence Quilter 7469q? I like the Confidence Quilter. It is a nice machine. If you are looking for something that can do quilting you should take a look at my list of quilting machines that I recommend. You can see the post on the list on the right. It lists inexpensive quilters all the way to some expensive, but amazing quilting machines. I bought the singer heavy duty and it is not good. Jams up frequently with no regularity to pin point the problem. Had it 1 year, it is so frustrating I am shopping for another one. It will not be a singer. Hi, I can not decide what machine to purchase and need help! I use to own an industrial Juki machine, which I loved, and never gave me any tension problems (that is a big plus) , I was wondering if you knew anything about the Brother computerized embroidery and sewing machine SE425? I feel I would be able to get a little more creative with it. I am in between the Brother and the Janome HD1000 machine, I want to be able to sew through denim without a problem, what would you suggest? The Brother SE425 is definitely a nice machine. However, if what you want to do is work with denim then I think the Janome HD1000 will sew through it a bit easier. The SE425 may be able to handle denim, but I never did try that fabric on it. HI, I am making tutus from up-cycled materials and need a machine that can handle gathered fabrics like denim and canvas. do you recommend the Janome HD3000 for this? Does the foot sit high enough for gathered materials to feed smoothly? I am also using faux fur. I will be making dozens of tutus a year and would love a machine that can handle what I throw at it! The Janome hd3000 can definitely handle denim and canvas. I have also used it with gathered materials without a problem. Although I can’t remember the exact clearance it has and couldn’t find it on their website. 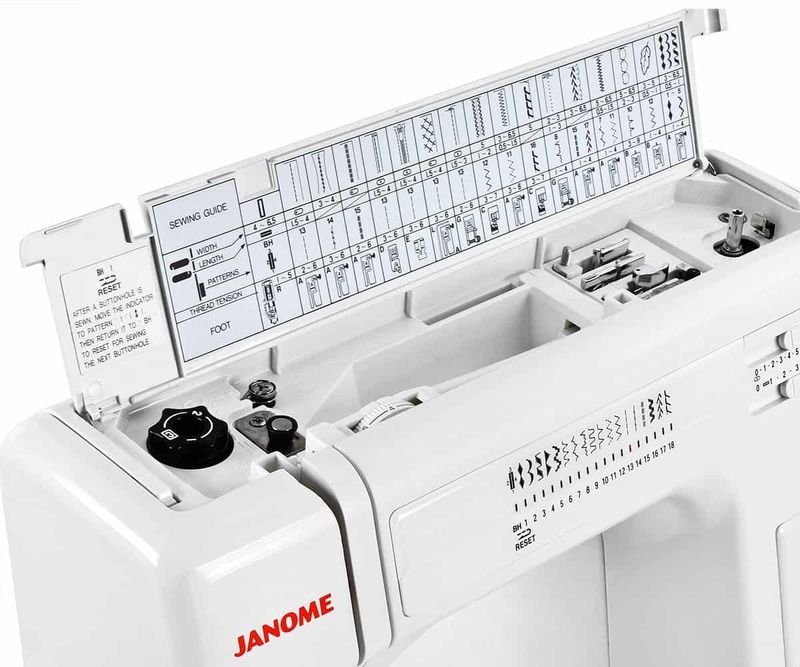 You may want to give Janome support a call first just to make sure it has enough room for what you need. I sew commercially and primarily use industrial machines. However, I also own several Janome HD3000’s and use them extensively when I am on the road. They are excellent portable machines without the headache of computer chips and electronic boards. They have all aluminum frames and body’s and will take hours of heavy duty sewing. Two of my HD3000’s are 4 years olds and literally have 1000’s of hors on them. I am just now ready to order two new ones so I can retire the old ones. I have more than justified the invest ment in these machines. That is great to hear. Thanks for sharing! Hi, which of the two Janome HD machines do u recommend for sewing totes, clutches and laptop sleeves? i will be using faux suede, canvas, faux leather, other upholstery and cotton fabrics. I would go with the HD3000. It isn’t that much more expensive and will work great for what you are working on. Here’s my question… at the shop, the sales person said that if I want power, I HAVE to get a mechanical machine (vs electronic, I guess?) with a front load bobbin. I’m willing to make adjustments if that will give me the power I need but I really miss the convenience of the drop in bobbin and electronic needle stop. Do you think this is true or were they just trying to make a sale? I wish to buy an entry level machine to do minor repairs to sheets and towels and the like.My wife recently passed and left me with a 44 year old Sears model 1030 that is above my pay grade (bobbin mystery) . She rarely used it so I am inclined to dump it. I plan to retire soon and would like to stretch my limited income. Any suggestions ? Hi Edward, the old Kenmore (Sears) 1030 is a decent sewing machine. If it has been taken care of it should work fine for you. Why don’t you look at some YouTube videos first to see how it operates and try it out. If it performs well then you don’t need to spend any extra money. My Babylock will not sew through a towel folded in half plus 2 cotton fabric with interfacing that has the towel sandwiched between the cotton fabric and interfacing. In addition. I turn the cotton fabric back but I do cut the interfacing back so that I only sew through the interfacing once. I’m sewing through 4 layers of cotton, 2 layers of interfacing, and 2 thicknesses of towel at the same time. My needle is not going all the way through all layers. Is there a sewing machine with a longer needle? I am looking for a more powerful sewing machine. Ready to take the next step. Been sewing for 3 years and currently making around 28 dresses, pants and leotards per month. I use mainly spandex, chiffon, satin, put zippers, elastic, sequin and buttons. I Owen a Brother cs6000i since may of this year which is way better than the last one. Now I understand there has to be a better option for so much sewing. I’ve been tempted in singer quantum 9960 or the janome hd3000. Which one do you recommend? Or is there another machine you think is better. Thanks for your help. Love your post. You’ve narrowed yourself down to two really good home sewing machines. I lean towards the Singer Quantum 9960 mainly due to the large number of features. It sounds like you will be doing a lot of sewing and get a bit creative. If that is the case, then you will love the quantum stylist. If you have any other questions, please let me know. Hi! I’ve been looking for a good, heavy duty, old fashioned mechanical machine (the ability to sew leather is preferable), and am trying to make the best choice without being too extravagant. I’ve been leaning toward the Janome HD3000 because I’ve only heard good things about it; however, there are a number of terrible reviews for it on Amazon. I was all set to by it, but now I’m having cold feet. Have you seen these reviews, what should I think of them, and if buy my machine at a dealer, will I avoid those problems? I was hoping I could get it for the Amazon price, and I doubt a dealer would be prepared to offer that. Am I just being paranoid? Thanks! I understand your cold feet. However the great majority of reviews are at least 4 stars. The ones that did give it a lower rating were disappointed that it couldn’t go through as many layers as they thought. People need to keep in mind that this sewing machine is only around $350 and geared towards the home user. In that price range you aren’t going to find something that breezes through a lot of layers. If that’s what you need you’ll probably want to spend closer to $1000. If you aren’t comfortable ordering online, then by all means contact your local dealer. Maybe they will at least come close the price listed online and save yourself some worries. I do most of my ordering online and haven’t had a problem when I’ve had to return anything, although (admittedly) that has been very uncommon. If you have any more questions or concerns let me know. I like Janomes, they’re good little machines, I have a couple of them and never had any problems with them, and god knows how many beginners have learnt on them. I had 2 Singer Heavy Duty machines and I don’t rate them. I wanted them for hemming jeans and because they have a faster sewing speed. One went back to the shop 6 times in 2 years due to faults, but neither was that good in general. they jammed up all the time and refused to sew multiple layers on thicker fabrics apart from when they were brand new or fresh from servicing. I had to have them serviced very very regularly to keep them doing what they were supposed to do. Admittedly I was running a business and they were used most days, but not for hours and hours every day, just a few pairs of pants. I then got a 1950’s Jones machine and it sews like a dream, I’ve used it exclusively for the last 2 or 3 years and it sews through almost anything, its smooth, quiet and a pleasure to use. However it is an old lady and is now getting a bit tired so i’m looking for a new machine. I find the modern plastic ones not a patch on the old metal ones. However the older ones can be difficult to get parts for and don’t have the range of stitches. It’s a dilemma! I haven’t used a lot of industrial sewing machines, but one that I did use that was really powerful was the Juki DDL-8700. It is a very high quality machine that isn’t too expensive. I need a machine for making totes etc. and will be sewing through multiple layers of thick fabric. I will be sewing everyday as I will be selling them. Do you think the Janomes are better than the Juki’s? Your post is so helpful, thankyou for this information. I need a machine that can sew thick layers of fabric for several hours a day. I’ve been advised by a couple of dealers and sellers on ebay that only an industrial machine will be able to cope with this. Do you think the Janome models you mention could withstand daily use for hours at a time? The ones in this are more for use in a home. They can handle heavy duty fabrics, but are not meant to be used every day for hours on end with thick fabrics. I would definitely go with an industrial machine if that is your intended use. I want to finish my own needlepoint projects and upcycle some vintage needlepoint. My anticipated projects range from pillows, to upholstery, to applique of needlepoint onto canvas totes and denim jackets. I also want to make slip covers for some furniture, as well as canvas or denim covers for classic manual typewriters (my husband is a collector of these gems). I have not had a sewing machine since the last century, and was so pleased to find this site as a starting point. I am leaning towards one of the Janomes – which machine do you think would best suit my plans? If you have the room in your budget, I would go with the HD3000. It is powerful and since you will be working with some heavier fabrics it’s better to be safe than sorry. Thanks for the quick response and the sound advice! Thank you for your thorough review of these sewing machines. I have never bought a new sewing machine, so I was lost in the abundant choices. This helped me figure out what I needed. I’ve decided to go with the Janome HD3000. Thanks to your help I feel confident in my choice. I have been looking at the Janome HD 3000 and HD 5000, which would you recommend for making items such as moccasins. Unfortunately I haven’t had a chance to try out the Janome HD5000 so I don’t have much to say about one. I think though if you are going to be making a lot of moccasins you might want to consider the Sailrite LSZ-1. It is really powerful and can handle a heavier workload. I’ve never sewn anything in my life, but I’ve decided to try making some puppets and other miscellaneous items. I just don’t know the limitations. The things I want to make would be constructed from faux leather, vinyl upholstery, faux fur, nylon strapping, and some sort of padding. I don’t plan on doing more than about 6 hours of sewing a week, but I think some parts will possibly be the equivalent of 3-4 layers of faux leather. Can the Janome HD 3000 handle that? I’m even considering hand stitching because I have to stay under $500 and I’m afraid no machine in that range will do what I need. I know I’ll need a walking or roller foot and the right needles, too. Thank you so much for your article and advice! I enjoyed your site with the reviews and the comments, so I decided to ask your advice. My 40 year old Viking just died. It was a wonderful workhorse and I loved it. I tended to push the machine and sewed with both light delicate fabrics and very heavy thick fabrics and multiple thicknesses. It worked well on everything. I also liked the free arm, which was great for sewing sleeves etc.. Do you have any suggestions for a replacement? I haven’t sew anything so far in my life , but I’ve been recently looking for a sewing machine that is not so pricey to fix some of my jeans. I bought a singer 3337 haven’t t opened it but I read bad reviews on it and im more than likely returning it. My question here what would be a good sewing machine for what I need it for ? Hello, I just started a small sewing business and I make a lot of dog collars (cotton wrapped webbing). No fancy stitches, but reverse is a must. I will also be making some bags. I have a Brother EX660 and have officially run it into the ground (It was my starter machine and I realize it was never meant for this kind of work load). It needs a tune up, but I think I move on and get something new. However, I also have my grandmother’s machine with is a Sears Kenmore 1774. Before I justify a new machine to my husband I want to make sure my grandmother’s machine isn’t a hidden gem, Do you know anything about the Sears Kenmore 1774? The last thing I want to do is kill my grandmother’s machine. Hi Sara, I’m sorry, but I don’t know much about the Sears Kenmore 1774. I believe it was a pretty heavy duty machine so it wouldn’t hurt to try it out. There are a few videos on YouTube that would give you an idea of what it can do. Here is one of them: https://www.youtube.com/watch?v=-zeNPxrkDCI Good luck! Thank you. I will give it a try and see how it does. Hi, I am trying to advise a group of woman in Uganda on good sewing machines for their business. They sew cotton items, and are looking for a machine that can take a lot of use. It must be reliable! I’ve been thinking about the Singer 4423, or Janome 2212. Reading your post, I’m also wondering about the Janome HD1000. The extra stitches of the 3000 aren’t important. Right now they sew on old Singer treadles!! I will be creating a fundraiser to purchase. So I want low repairs, longlasting, and price point is important. Hi Gloria, Sorry I didn’t get to reply sooner I was on holidays and without much internet access. Your question is a tough one. I think your best option is to talk to your local sewing machine store and see which ones would be the most reliable. As I assume they won’t have much access to parts and or service centers. Asking someone who regularly services machines would be able to give you a better answer and hopefully one that will work out better than my opinion. As far as which machine I like better, both the Janome HD1000 and 2212 are good machines. I haven’t heard of too many issues with them. I own an upholstery shop and have been using a consew 206RB-3 for 8 years. But the machine has been in use for probably 30 years. It’s starting to get me grief. So I want to buy a new one. What is your opinion, should I replace it with another consew, maybe a 206RB-5 or the sailrite table model, I think it’s called the fasinator. Hi Lori, I haven’t had a chance to use a consew before or many industrial machines. I do get a chance to try them out, but on a daily basis that isn’t what I’m familiar with. Based on what I have heard, both are great machines so I really don’t think you can go wrong. If you can talk to a sales person about them before you purchase it might help you decide. Or see if you can find any youtube videos with reviews to see which one may be more suitable. Sorry I couldn’t be more help. I need heavy duty not necessarily for thick leathers but more for stretchy fabrics, lots of elastic, sewing while stretching fabric, lots of custom fabrics with sequins, feathers and more. Any advice would be greatly appreciated. I make pram liners (approx 2cm of poly wadding between 2 cotton fabrics) and my trusty Janome JR1012 has finally given up. It was such a great little workhorse! (even though it really wasn’t made for what I was sewing). I’m looking to update and was considering the Janome HD3000 and stumbled across your very informative post. Thankyou! I’m sure this machine will handle the work, but I often do up to 4 hours a day on my machine now. I also sew thicker canvas type fabrics and some cottons with plastic layers. Do you think the HD3000 would last? Or is there an industrial machine you would recommend? We have limited choice here, and I’d even have to import the HD3000 from the USA as we don’t have a comparable model available. Would love some help, please! Would a Janome HD3000 or HD5000 sewing machine be a suitable choice for making quilts? Hi Deb, I’m sorry, but I haven’t had the chance to use the HD5000 yet and don’t know a lot about it. The HD3000 is one that I have used and it is perfectly fine for making quilts. I am starting a horse blanket repair business and need to upgrade to a machine that can sew thru heavy weight fabric such as canvas and nylon strapping. Would the Janome HD3000 be the best or should I look at industrial ones? I am looking at the Janome HD3000 and am looking for information on the needle position when you let off the foot pedal? I currently have a Singer that whenever you let off the gas, the needle goes up and you have to reposition it before you can make a corner and it is sooooo frustrating to me. This question is the only one holding me back. Thank you so much for your time. I greatly appreciated your review as it helped me make my decision.